These perceived drawbacks are at worst entirely fictional and at best easily gotten around with some simple planning. And most importantly, the benefits of a vegan diet far outweigh any disadvantages that might come from skipping animal products altogether. But if your experience is similar to mine, then you’ve had quite a few moments when you’re stuck trying to explain to someone why eating a plant based diet will not put them at risk of not getting enough protein, or why such fears are entirely misplaced to begin with. So my intention for this article is to provide any aspiring vegan evangelist a handy reference guide to use when confronting others about how and why the most common pariahs of the vegan diet are based on false premises. With that in mind, let’s lay down the gauntlet on these chimeras. Plenty of plants are good sources of bioavailable calcium. Vegans generally have lower calcium requirements due to less sodium and sulfur containing proteins found in animal products. To be fair, it’s true that calcium is absolutely vital to a healthy diet, and dairy is a very potent source of bioavailable calcium. So this line of reasoning has some truth to it. Green vegetables that are low in oxalic acid commonly deliver calcium that is more readily absorbed by the body than milk, and per gram often have a calcium content that is very similar. And what’s more, a plant based diet can lower the body’s need for dietary calcium. Plant foods tend to be more alkaline than meat and dairy products, and calcium is used as a buffer to lower the body’s pH, negatively affecting your body’s calcium balance. Omnivorous diets also tend to be higher in sodium and protein, both of which can increase the amount of calcium that is excreted from the body and lower bone resorption. The latter point does not diminish the importance of calcium in the diet or the need to get an adequate amount. It just points out the possibility that vegans have a different calcium homeostasis than omnivores. 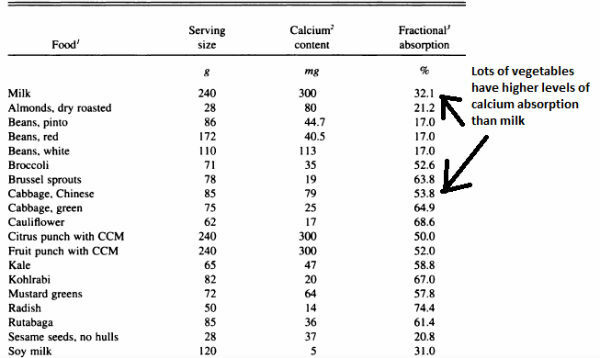 To illustrate my point, a study published in the British Journal of Nutrition found that vegans consumed about 30% less dietary calcium than omnivores, but had an insignificantly different calcium balance. Calcium is the most abundant mineral in the body, mostly because the body uses it to build bones. 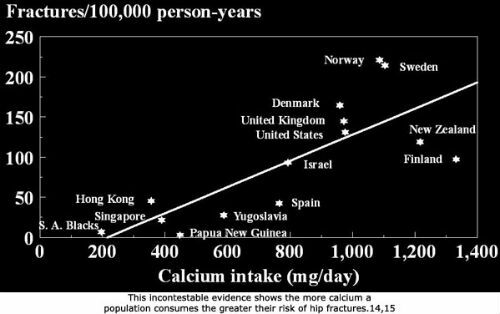 So if omnivorous diets are better sources of calcium then people who follow them ought to have better markers for bone health. However, assuming adequate amounts of calcium are ingested, there is no appreciable difference in bone mineral densities between vegetarians and omnivores. Furthermore, increased intake of animal protein has been shown to be positively correlated with hip fractures and osteoporosis, and lifestyle factors such as bodyweight and physical activity negatively affect bone mineral density, often more so than dietary calcium. Protein is the building block of all cells. If you consume your calories from real food, you have no choice but to consume adequate amounts of protein as a result. Protein deficiency is all but unheard of in western diets. A common argument in favor of omnivorous diets is that animal proteins are “complete”, which usually means they contain greater amounts of essential amino acids than vegetable proteins, which is important to your health. People who make this argument don’t know what they’re talking about. Most people get way more essential amino acids then their body knows what to do with….often to harmful effects. If you look to the right you’ll notice people typically get about four times as many essential amino acids as the body needs. So, no, you won’t be teetering on the edge of serious deficiency by foregoing animal products. In fact, you’re probably better off for eating less of it. Your body doesn’t store protein, and eating too much is a more common problem than eating too little. Excessive protein intake over the long run results in undigested amino acid metabolites that can lead to gout, arthritis, kidney stones and high blood pressure over a lifetime. Vegans and vegetarians often have higher iron requirements than omnivores because the type of iron they typically receive in the diet is non-heme iron, which is not absorbed as well as heme iron, the type found in meat. However, like all other nutrients, eliminating meat doesn’t leave you stranded in a barren nutritional dessert, destined to the suffocating atrophy of deficiency and deterioriation. Nuts, beans, legumes, soy products, and iron fortified foods can all give the body enough iron to keep going strong. Vegan diets are also aided by higher levels of vitamin C, which increases iron absorption. 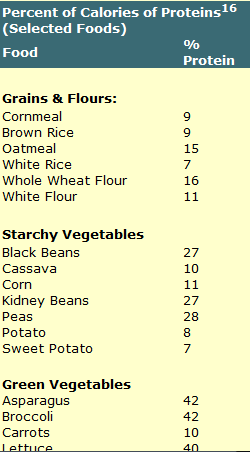 When well planned, a whole foods vegan diet does not result in lower rates of iron deficiency than omnivorous ones. As much as I’m loathe to admit it, when it comes to B12 the meat eaters have a point. Vitamin B12 is a substance that’s only made by bacteria and is stored in the cells of animals but not plants. For this reason plants cannot be counted on to regularly provide vitamin B12, even though fermented foods can provide some in small quantities. So…..does this finding invalidate the nutritional basis of the vegan diet? In order to avoid symptoms of deficiency the body can get by with as little as 3-5 micro grams per day. If you didn’t digest any vitamin B12 from today onward it’d probably be 5 years before you noticed a difference in your body. A large portion of vegan food bought in stores is fortified with B12, and this is typically enough to avoid worst case scenarios for B12 deficiency. However, to be safe, it’s a good idea to use a B12 supplement if you’ve been vegan for more than 3-5 years. And ironically, it’s hard to find a supplement that provides only the amount you need on a day to day basis……they typically provide way more than is necessary. One might infer that a vegan diet is not what nature intended if it doesn’t naturally provide an essential nutrient. This intuition makes sense, but it neglects the differences in how humans interact with their environment compared to when our nutritional needs were formed. By far the best source of vitamin B12 in the environment is feces. Bacteria in your colon actually make more than enough B12 to survive on, but because they live south of the ileum not very much is absorbed. In an environment where people are closely connected to the food they grow and not isolated from natural fertilizers growing conditions in the soil are likely to provide more than enough B12, even on a vegetarian diet. Sometimes the benefits of a vegan diet are hard to articulate, because your explanation has to debunk some typical canons of dietary thought. This is too bad, because it’s prevented me from meaningfully engaging people who were genuinely curious about the benefits of a plant-based diet, but needed to overcome some doubts before trying it out. I’ve found that people who are fearful of change can’t be nudged into action, they need to be patiently led to the final outcome by overcoming all objections that are floating around in their heads. Only after they’ve been shown that it wouldn’t make sense to not do it does it feel safe to dip your toe into the waters and give it a shot. There are slightly different opinions out there about the B12 issue. I personally have always supplemented with it. I see no harm in doing so and would much rather “cover my bases” by taking supplemental B12. This is a great article. I thought it Would be interesting to share that there have been several meat eaters that I know who we’re diagnosed as B-12 deficient. I am curious what that is about. Strange right? That is interesting to hear! I know that there are a lot of meat eaters also deficient in other vitamins and minerals. There’s no danger in taking a B12 supplement right away. The worst that will happen is you’ll excrete it out. Not a big deal. But for most people the 3 year mark is probably when you have to start thinking about it. I have been vegan for over 30 years and have NEVER EVER taken B12 supplements or ANY foods fortified with B12. That’s because I eat avocado and seaweed. No need to eat anything that came from an animal and I am living proof. So how do you get b12 vitamins you need? Avocado and seaweed are not enough. One more point about B12… most meat eaters get their B12 from the animals themselves being given supplements, then they eat that B12 through the meat they eat. So, we’re all sort of supplementing B12. But, it’s important for all of us to do it! I use this sublingual spray. It’s best absorbed when sublingual, very superior to oral absorption. You need 2000 mcg/week, so you can either do 4 sprays once a week, or one spray every other day. Great points!. I think so many people don’t realize how many meat eaters are deficient in B12…this is definitely not an isolated problem for vegans. Factory farmed animals have no vitamins, minerals, calcium or even the protein . Maybe this applied when they were roaming free and ate grass! That is all you need to tell people. It is all fortified! It’s a lie! Not to mention the antibiotics, steroids, chemicals in meat and dairy. Why not include the entire chart from the American Journal of Clinical Nutrition on food sources of calcium? I am vegan and studying integrative nutrition. I agree completely with the words you wrote. 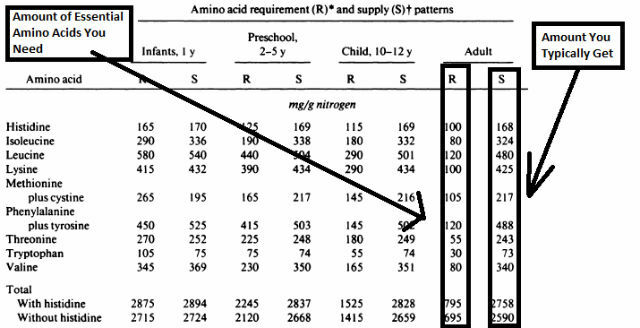 I was about to reference the chart but looked up the study and noticed the last two columns missing- “estimated absorbable calcium” and “servings needed to equal 240 mL of milk”. Milks estimated absorbable calcium is 96.3 mg per serving. Bok choy actually has the values your arrow above is pointing to with an absorbable calcium of 42.5 mg and 2 servings needed to equal milk. (which is no big deal. Bok choy rocks).The real chart still has even greater results! 1/2 cup of chinese cabbage flowers or mustard greens has just about the same calcium serving of milk! I’ll take veggies over milk any day but just wished you showed the whole chart and the correct corresponding info. What’s frustrating (about the study itself) is the abstract reads that the conclusion is a vegetarian diet does NOT afford sufficient levels of calcium. yet if you calculate what some of the serving sizes come out to – it’s not hard at all! and adds a ton more vitamins to the diet that milk can. goes to show you how slighted research can be by dairy industry influence.